In areas without municipal sewage systems, each home must treat its sewage on its own land using an “on-site sewage disposal system,” more commonly called a septic system. A typical system consists of a waste pipe from the house, a large concrete, fiberglass, or plastic septic tank, and a leach field. The most common type of leach field consists of a series of perforated distribution pipes, each set in a gravel-filled absorption trench. Sometimes a small group of homes share a larger community septic system that performs much the same way as a single-house system. After passing from the house, the wastewater collects in the septic tank. 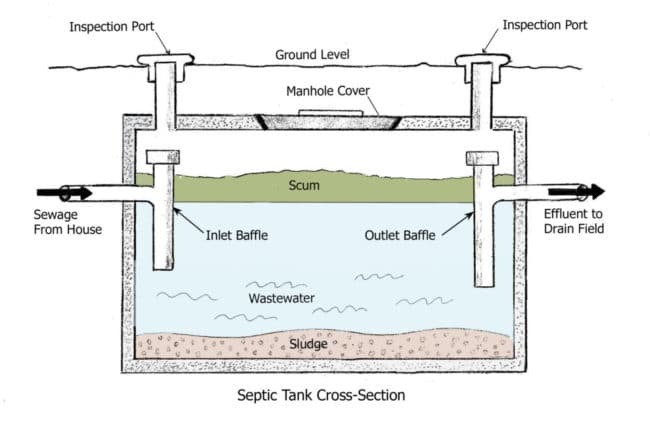 Septic tanks typically range from 1,000 to 2,000 gallons and are made of concrete, heavy plastic, or metal. High-quality concrete tanks are the most durable and, if not damaged, should last 40 years or more. Many modern tanks have two chambers to increase the efficiency. Tanks are sized large enough to hold new wastewater for at least a day, giving it time for the solids to separate out and settle. In the tank, oil and grease float to the top of the tank as scum and solid waste sinks to the bottom as sludge. The partially treated wastewater, or effluent, is mostly clear (see illustration). The solids at the bottom are subject to a host of bacteria and other microorganisms that begin breaking down the materials in an anaerobic (without oxygen) process. Over time, the sludge at the bottom and scum at the top build up thick layers. To keep the system working properly, the solids and grease must be pumped out during regular maintenance of the system. As new wastewater enters the tank from the house, the partially treated water, or effluent, flows from the tank into the leach field, where most of the sewage treatment takes place. Each new gallon into the tank sends one gallon out to the leach field, leach pit, or similar treatment area. Too much water delivered too quickly to the tank will send untreated effluent, along with grease and solids, into the leach field, potentially clogging the field. The leach field (also called a “drain field”) consists of rows of perforated pipes buried in gravel trenches 18 to 36 inches below grade, deep enough to avoid freezing, but close enough to the surface to allow air to reach the bacteria that further purify the effluent (see illustration). The perforated pipes are covered with about two inches of gravel and a layer of topsoil, typically 18 to 24 inches deep. A sheet of geotextile (or hay in the old days) keeps the topsoil from clogging the gravel below. Grass is usually planted above. The grass helps remove excess moisture from the soil without sending down deep roots which can block the piping. The effluent passes from the perforated pipes into the surrounding gravel and on to the native soil. Where the gravel meets the soil, a bacteria-rich slime mat grows and does the heavy lifting of water purification. All elements carrying liquid must be buried deep enough to prevent freezing, as this will stop the bacterial action that the system depends on. Wastewater freezes at a much lower temperature than does pure water but freezing is still a concern in cold climates. The remaining liquid, carrying small suspended solids, percolates though the native soil, where it receives its final treatment by bacteria and other tiny critters in the soil. These convert the remaining pathogens into important plant nutrients, while sand, gravel, and soil filter our any remaining solids. Some of the liquid evaporates into the air, and some is absorbed by plant roots. At this point, if the system is working properly, the filtered wastewater returns to the aquifer as naturally pristine water, fit for human consumption. It’s a pretty neat trick that takes perfect advantage of nature’s highly effective process for recycling organic waste. Where a conventional leach field will not work due to poor soil conditions or a high water table, an alternative system may be allowed. These often cost two or more times the price of a conventional system and require greater maintenance. Special systems may also be required near flood plains, bodies of water, or other environmentally sensitive areas. The drain field uses perforated pipes placed in gravel-filled trenches, and is sized for the number of bedrooms. For the system to work well, the leach field must be properly sized for the soil type and volume of wastewater, typically based on the number of bedrooms. The soil, as measured by a perc test, must be porous enough to absorb the liquid, so the denser the soil, the larger the leach field required. For a three-bedroom house with normal soils, the total leach field area may vary from about 500 to 1,500 square feet. It’s better to have excess capacity in your system than to cut it too close. Your family may grow or you may get an exceptionally wet spring with saturated soils and a higher-than-normal water table. If the ground cannot absorb the liquid, then sewage can back up into your home, pool on the surface, or pollute nearby groundwater. Also, if there is not enough depth of good soil before reaching rock, impervious hardpan, or the water table, then the system will not work correctly. Dense clay soils will not absorb the liquid fast enough, causing backups. But the soil can also be too porous. If the soil consists mostly of course sand and gravel, it can drain so fast that untreated sewage can pollute the aquifer or nearby bodies of water are polluted. System designers need to take all these variables into account. Treat your system well and you will be rewarded with years of trouble-free service. Periodic pumping of the septic tank is essential to remove the solids (sludge) and grease layer (scum) from the tank. Otherwise, solids will eventually overflow the tank and flow into the leach field, reducing its effectiveness and shortening its life. It is difficult or impossible to rehabilitate a clogged leach field, so regular pumping is critical! Forgetting to pump out the tank is the leading cause of premature failure of septic systems. Cooking fats, grease, and solids can also wash into the leach field if the tank is too small for usage levels or is overloaded periodically. Fats, petroleum products, and solids that reach the leach field can clog the biological mat where the leach trenches meet the soil and interfere with its job of purifying the effluent. Use low-flow appliances, faucets, and fixtures in kitchen and bath. In general, toilets generate the most water usage. Direct drainage from the yard, gutters, and basement sump pumps away from the leach field. Do not place a deck, patio, pool, or any type of structure over the leach field. Keep trees and plantings with deep roots away from the leach field. Grass is the best groundcover. Even with gentle use and regular maintenance, however, leach fields will not last forever. The soil will eventually become clogged from dissolved materials in the wastewater, and the soil will be unable to absorb the incoming water. An odorous wet area over the leach field, or plumbing backups in the house, are often the first signs that things are amiss. Many areas require septic system designs to include a second “reserve drain field” under the assumption that the first field will eventually fail. A properly designed and maintained system should serve for 20 to 30 years or more. • Leach field piping. Driving or parking heavy vehicles over the leach field can break the perforated leach pipe, especially if it is not uniformly supported by the gravel bed. Usually tree roots do not penetrate through the gravel bed into the perforated piping. • Leach field sizing: Drain field may be too small for current flow levels out of the home. Reducing flows though use of flow restricters, and low-flow faucets and fixtures might help. • High water table. A seasonal high water table can saturate the soil around the trenches impairing the soil’s ability to absorb wastewater. This is sometimes an issue on relatively flat building sites with poor surface drainage. This can often be fixed by installing subsurface drains or curtain drains to intercept the water flow toward the leach field area and to lower the water table locally. 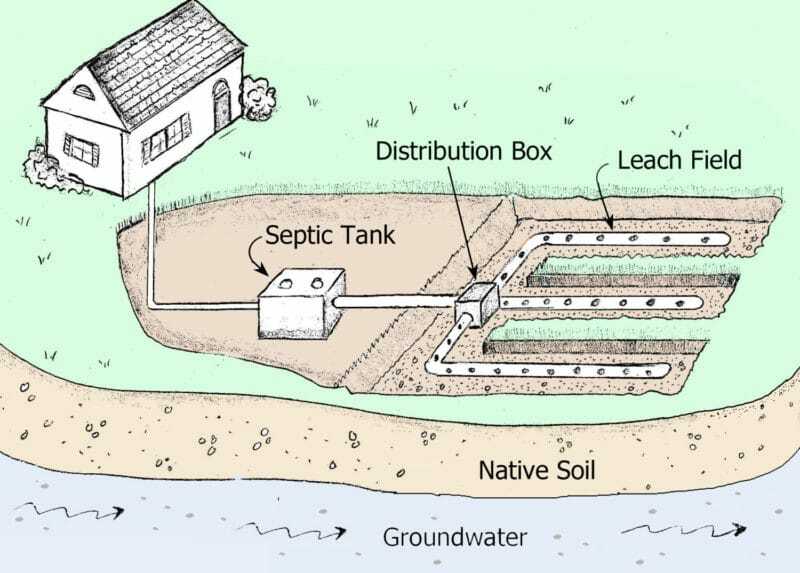 For more information, download the EPA Homeowner’s Guide to Septic Systems . Can We Locate Septic System Anywhere On Lot? We are looking at some land that was already perk-tested and has an engineered septic permit in place. Does the engineered septic have to be set in a certain place or can we place it wherever we would like on the land? In general, the drain field on a conventional or engineered septic system needs to go in the same location where the soil and perc testing were done. That’s because the soil, water table, and drainage characteristics may vary from one part of the site to another. The system is only approved for the area where the soil and groundwater level were tested. Most septic plans I’ve seen have included a site plan with a specific location for the drain field and other system components. Because of setback restrictions to property lines, wells, water lines, structures, etc. there is often little flexibility in where the septic system (and the house) can be located. In some cases, you can change the location of the septic tank or pumping station, but not the drain field or main treatment unit in an engineered system. On larger sites, you often have greater flexibility for locating the house and septic system, but will need to check with the engineer about what flexibility, if any, you have in locating the system. You should be able to put your hands on the septic permit from the health department, DEQ, or whoever issued the permit, which is a matter of public record. It may indicate any limitations on placement of the system. Also check to see if a septic system design has been drawn up and where it shows the location on the site. For further clarification, check with the health department or the engineering firm. Should Ground Be Settling Over Drainfield? The ground continues to settle around the engineered system installed October 2017. Seven loads of topsoil were used but it continues to settle. Is this a normal occurrence? Should the contractor have used more initially? They have not been the easiest to work with so I’m trying to do some homework on this. Not sure exactly what type of “engineered” system you have, but a well-designed system should not have excessive settlement. Some degree of settlement is normal in the topsoil layer. However, excessive settlement might indicate an inadequate barrier between the soil and aggregate below. In any system that uses aggregate (gravel or crushed stone) for dispersal of the effluent, the topsoil should be separated from the aggregateby a geotextile which stops the soil above from migrating into the stone, but allows air and moisture to pass through freely. Some older systems used building paper or a few inches of straw as the barrier material, but these are not widely used today. The topsoil layer is typically 18-24 inches deep, but can be a little more or less, depending on the specific design. If the barrier is inadequate, the topsoil can infiltrate the aggregate layer and reduce its effectiveness. The soil place on top should be free of vegetation, rubble, or other foreign materials that can also lead to excessive settlement. It’s best if the soil over the drain field is slightly raised above the surrounding area so heavy rainfall does not collect in the area and saturate the system. Excessive settlement could create a dip where water tends to pond. I would contact the designer of the system to find out what he has specified, and ask for a schematic of the system. Then ask the contractor whether he has followed these specifications. If you do not get satisfactory answers, then you may want to have the designer do an “as-built” inspection of the system, which is required in some jurisdictions. If the contractor did not follow the plan, then he will have to do the remedial work necessary to get the job done right. Leach Field on Wooded Lot? Can there be too many trees for a leach field? Does there need to be a clear spot to begin with? In general, a leach field can be constructed on a wooded site that has been cleared, but it would have to be completely cleared and stumps removed over and around the drain field. When clearing the land, however, you don’t want the excavator to disturb or compress the soil any more than necessary to get the job done. ALso, do not regrade in the area of the drain field. Codes generally require that the leach lines be constructed over undisturbed, native soil. You will also need to clear the area around the leach field so that trees and large shrubs are a safe distance from the drain pipes. Not surprisingly, tree roots are attracted to the nutrient-rich water in the perforated drain pipes and can invade and block the pipes, causing the system to fail. The minimum recommended distance from the drain pipes to trees and large shrubs is 20 to 50 ft., with a greater distance to larger trees or tree species with aggressive root systems. Problem trees include maples (except Japanese), birch, beech, willow, ash, aspen, and poplar. Our sister site, Inspectapedia, recommends that trees are no closer to the leach field than the height of the mature tree. In some cases, you may be able to shrink the size of the leach field by using engineered gravel-less leach lines or other alternative systems. Drip irrigation can also be designed to work on heavily wooded sites. Which alternative systems are allowed in your area varies with local codes. Be aware that most alternative systems have higher initial costs and higher maintenance costs. Best of luck with your land purchase and new home! I am looking to buy a piece of property and the county soil maps show that the parcel has both high shrink-swell soils and low shrink-swell soils. When trying to find the right place for building, how do I take into account these soil results as far as the type of septic system I will need? Thanks. High shrink-swell soils have a high clay content, which means the soil will not absorb water well, making it unsuitable for a conventional septic system. Because of the slow absorption of water, soils with high clay content are likely to fail the perc test. This type of soil is often referred to as “expansive clay,” which is bad for any type of building. Unless the foundation is engineered for expansive clay soil, you can end up with extensive foundation damage over time. The “low shrink-swell” soils are certainly a better bet for building, but no guarantee that the site will perc. It could still have high clay content or other problems such a high water table or impermeable soil too close to the surface. That’s why every site needs a perc test to determine whether it is suitable for a septic system and to properly size the leach field. County maps are a good place to start, but the information is rarely accurate enough to site your house and septic system. You really need to visit the site and examine the soils. How To Size the Leach Field? My land passed the perc test. I will put in a 1000 gallon septic tank. There will be two people living in the house. How much lateral line will I need? The size of the leach field and linear feet of trenches, depend on the number of bedrooms (not the number of people), tank size, soil characteristics, and local regulations. Better draining soils require less area. Also modern houses with low-flow fixtures have lower daily flow rates than older houses, so the leach field may be smaller. Septic system designers calculate the required length of the trenches from the total daily flow, the absorption rate of the soil, and the width of each absorption trench. Maximum trench length, distance between trenches, and added “reserve” space are also determined by local code. Codes typically limit trench length to about 60 feet. Total drainfield size for a typical 3 -bedroom system may range from a 4,500 sq. ft. for good soil to twice that size for poor draining soil. For a more technical explanation of leachfield sizing, please refer to our sister site Inspectapedia at this link. When Can Town Require Septic Inspection? My mother owns about ten acres of rural land in PA. She is subdividing the land and selling me three acres. Our surveyor says that the law for subdivided properties is that in order to build on the land, my mother’s septic system must be evaluated and brought up to current codes. Her septic would be about 300 yards from my septic. Why is this an issue? The short answer is that local governments (town, city, county, state) can require septic system inspections whenever they want to, in accordance with local laws. Each jurisdiction makes its own rules and these vary a great deal from place to place. Where inspections are mandatory, they are typically required when you build, remodel, subdivide, or do other work that requires a permit – that is, when the local government has the leverage to force you to perform an inspection and upgrade the system to current code, if required. Inspections and upgrades may also be required before transferring title to a new owner. In some cases, the inspection requires partial excavation to inspect the leach field or septic tank. The cost of an inspection can range from $200-$600 or more depending on the requirements. If repair or replacement of the septic system is required, the cost can be anywhere from a few thousand dollars to $10,000 or much more if an alternative septic system is required. This can come as a big shock to homeowners planning to remodel or sell their home. It may seem unfair that you are required to inspect a septic system when you are not changing the rated use of that system, such as adding a bedroom, but this is becoming more common as local governments get more aggressive about protecting groundwater. You can contact your local health department or building department for further information about why an inspection is required, who can perform it, and what are the consequences of a failed inspection. A conventional leach field that was well-designed and maintained should last 25 to 30 years, or longer if usage was light. Best of luck with your septic inspection and planned subdivision! Can you have storage buildings without septic service? In general, any residential dwelling unit or commercial building with a kitchen and/or bathroom would require a septic system. You would not need an on-site sewage system for an uninhabited storage building without running water. If you have utility sinks or other water uses in a commercial building, but no bathroom, you might be able to get by with some type of wastewater holding tank that would need periodic pumping. The type of system will depend on the type of wastewater being disposed. Since these regulations vary from town to town and state to state, you need to check in with your local health or building department to find out what rules would apply to your intended uses. In general, any residential dwelling unit or commercial building with a kitchen and/or bathroom would require a septic system. If you are using a lot for storage buildings only without any running water, then you shouldn’t need any sort of on-site sewage system. If you have utility sinks or other water uses in a commercial building, but no bathroom, you will probably need at a minimum some type of wastewater holding tank. The type of system will depend on the type of wastewater being disposed. Since these regulations vary from town to town and state to state, you need to check in with your local department of health or building department to find out what rules would apply to your intended uses. Multiple Septic Systems on One Lot? I am looking at purchasing 5-10 acres with the hopes of placing a 3-bedroom home and possibly two or three “Tiny Homes” to use as rental units on the same property. I have seen several properties that perc in numerous places on the property. Does this mean that there could be more than one septic system and leach field if the different locations are far enough apart? In general, the answer is yes, it’s possible to have multiple septic systems on one property, but it may be more economical to tie into one large system. At most, you would want two systems – one for the main house and one for the Tiny Houses. These issues are heavily regulated by the local health department, so you need to check with them to see what is allowable. The distance from one leach field to the another is generally not a concern. Of greater concern to regulators – and to you – is the distance from the leach field to a well, house foundation, potable water piping, and open water (lakes, ponds, streams). Also, you need to consider what is at the ground surface. In general, you don’t want trees near the piping or drain field or roads running over any of the components, unless they are specifically designed to handle traffic overhead. If the buildings are spread out, having more than one system may make sense. Typically, the distance from the house to the septic tank is in the range of 10 to 20 feet, but could go farther. The distance from the tank to the leach field can be much greater as the effluent at this point is clear liquid. If you cannot drain by gravity to the leach filed, a pump is needed which increases cost, complexity, and maintenance. Talk to your town or county health department about your ideas and see what options are acceptable in your jurisdiction. Best of luck with your project. How To Tell If Drainfield Exhausted? How do you know when a drain field is “used up”? We are looking at a home with a 26 year old drain field. It held a family of six for the first 10 years and then dwindled to the last two lovely owners who hold grand parties of 40-60 guest two to three times each year, the tank is pumped every five years presently. The home in in South Carolina and has two large creeks on one side of the home, a flood plain area, and an acre pond below the drain field and house. General information online says a field will last 15-30 years. How do you know when it is at the end? Is there a way to test and have a better understanding of the potential longevity of an old field? The numbers I usually hear are 20 to 30 years for a properly designed and maintained drain field. A lightly used and well-maintained field can certainly last longer. The longevity depends heavily on the original design, usage level, and maintenance. Water-saving fixtures will help extend its life. Harsh chemicals, grease, animal fats, disposals, and solid materials disposed into a drain field can shorten its life. Assuming that the original design is adequate and usage moderate, the most important factor is regular pumping, which it sounds like the previous owners have done. A septic system contractor can tell you if you have a failed system, but I’m not aware of a test to determine how long a functioning system has left. The typical signs of a failed system are slow drainage or backups, and a soggy, smelly mess at the surface of the ground over the leach field. If you have slow drainage or backups, you will need to determine if these are caused by problems with the tank and other components or by a failed leach field. When they pump the system, the pumping contractor can usually identify problems. If necessary, a dye test can be used to confirm that the field has failed. Being surrounded by water and a flood plain could also be a concern. A water table that is too high can impair the drain field and also lead to contamination of the aquifer or pond. Modern codes call for the drain field to be a minimum distance above the seasonal high water table and may require a raised drain field (mound system) or other alternatives in that case. Pollution of the aquifer would show up as an elevated nitrate level in your well or pond, so you might consider a water test, which can usually be arranged through your town or county health department for a nominal fee. I recommend visiting our sister site, Inspectapedia.com, which has excellent information on SEPTIC SYSTEM TESTING and related topics. Dan Friedman, of Inspectapedia, recommends the following. • Find out what sort of tank is installed. Steel with rusted baffles is bad. Concrete in good condition with a safe cover is good. • Try asking the septic pumper if, the last time they pumped the tank, they saw trouble signs like backflow into the tank from the drain field or damaged baffles, or evidence of a damaged tank. Low sewage levels indicates tank leaks. Unless the pumpout was recent,however, they may be reluctant to provide information. • We don’t test the leach field biomat itself. But you could have a septic loading and dye test done. Read more at SEPTIC LOADING & DYE TEST. That can at least tell you if the system has already failed. You can also tell this from on-site inspection: look for odors, liquid “breakout” on the surface, or funny grass. Same Trenches for Leach Field and Geothermal Heating? I am in the early planning stages of construction in the Teton Valley of Idaho. I would like to do a geothermal loop and I am wondering if I could use the same trenches for the leach field. Since the GT lines are approximately 6-7 feet in the ground I could cover with a few feet of dirt and add the drain pipe, then cover the remaining 3-4 feet. Thoughts? Interesting idea and could save you some money, but I’m not sure it will fly. First off, I would make sure it passes muster with both the septic system designer/installer and geothermal contractor – as well as the local code officials, assuming you have building codes in your area. 1. The soil around the geothermal loop gets chilled all winter and could freeze in your area over the course of the winter (which is why most ground loops use antifreeze). Since freezing can be an issue with septic systems in cold climates, it’s possible that combining the two systems would increase the likelihood of septic system freeze-ups. 2. Leach fields are generally placed on well-drained, undisturbed soil. The percolation rate of the soil (along with the usage) determines the size of the leach field. If you are building your leach field on backfill, you will need to take that into account and use suitable fill. In general, geothermal systems like dense and moist soil, while septic systems like dry and granular soils, so finding a soils type that works for both could be tricky. Anyone else have experience with similar installations? A piece of land I am considering purchasing already has a septic system installed for a 3 bedroom 2 bath structure. Should I still request a soil test for a foundation be done and make the purchase contingent on that? I have been told that since a standard septic was allowed that the land should be suitable to build on as it is. If the owner refuses this, are they expensive to have done? If you are in an area that requires perc testing and approved septic system designs, I would ask for certification that the town/county health department (or building department) has approved this system for a three-bedroom house. You can never assume that proper testing or design was done for the existing system. Also, you should ask for septic system maintenance records and have the system inspected during your “study period”. If the system has been poorly maintained or is near the end of its service life, then you could be in for an expensive upgrade in the near future. A perc test should not be necessary unless there are questions about the current system. As for soil testing or an engineering review of the site, this is usually not required unless you have reason to believe there are special problems such as buried toxic waste, filled land, organic soils such as peat, solid ledge (a problem if you want a basement), wetland areas where building is prohibited, or a site with extreme water problems. While these problems are relatively uncommon, they are certainly worth considering when evaluating a building lot. Almost all of these problems can be solved with money. Even building on regulated wetlands is sometimes allowed if you create replacement wetland areas. An inspection, typically by a civil or soils engineer, can help you identify and budget for these types of problems. If you have reason to suspect problems, or just want to sleep easier, by all means get an engineer to examine the soil and drainage conditions in the area where you intend to locate the house. Allow time in your study period to perform the necessary inspections. I can’t tell you what it will cost, but, around here, I’ve have engineers do limited inspections of structural plans or land issues for well under $1,000. Find a small engineering firm, describe what you need done, and get cost estimate before proceeding. The more you can narrow his scope, like inspecting for just for water issues, the less you will pay. Nice article – helpful and clear. A common problem on older sites is that there is or was a septic tank or cesspool and drainfield but no one is quite sure where. It’s often possible to make an intelligent guess by examining the lay of the land, slopes, location of mature trees, etc. asking “where would an excavator have considered it possible to *put* a septic system tank and drainfield? I’d add a safety warning to beware of abanodoned or old, poor condition septic tanks, cesspools, and drywells; if a cover is unsafe or if someone falls into one of these it can be fatal very quickly.